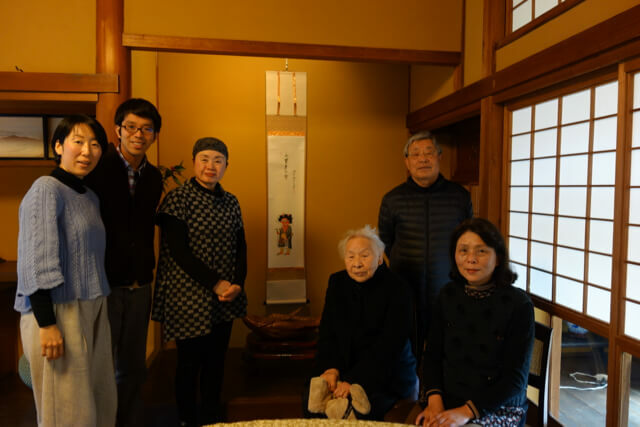 Talk of January 2018, celebrating our grandmother ‘s birthday, we visited Ukidake Saryo : a Japanese kaiseki-style cuisine. 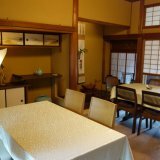 We could enjoy the wonderful Japanese food, feeling the seasonal hospitality! The place is in Nijo-Yoshii, and it is close to the prefectural border with Saga. 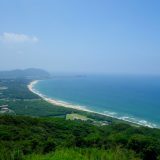 The distance between the sea and the mountain is close, it is a rich natural place. 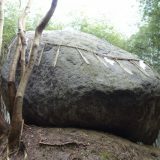 At the mountain side, Ukidake Saryo is there. 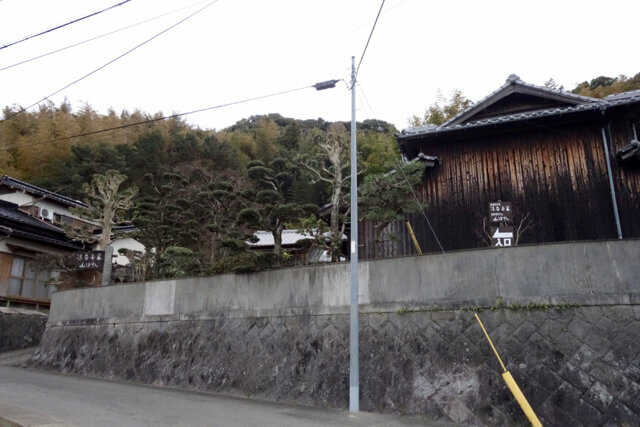 Walking from the parking lot, we can see the beautiful outside wall of “Yakisugi(=Burned cedar board)” . Going around the fine stone wall, we entered the site. 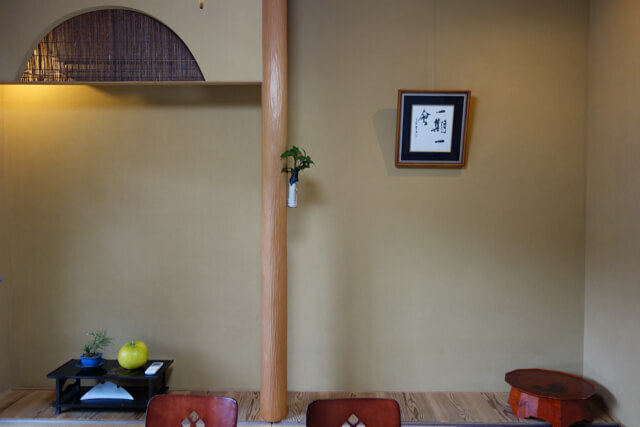 Omoya(=main house) is Kaiseki cuisine restaurant. 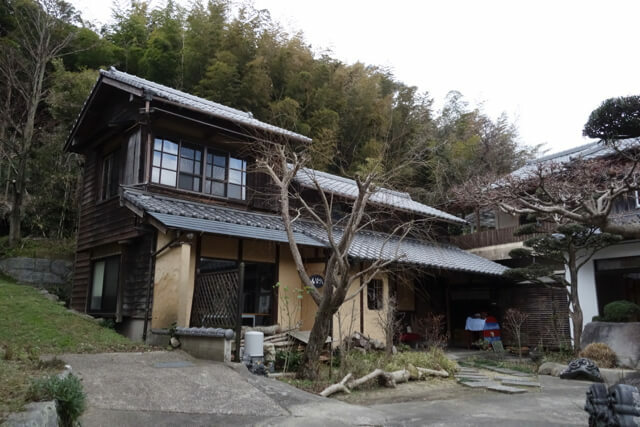 Next to the restaurant, there is the cafe Yamaboshi. As of January 2018, the cafe menu seems to be offered in the restaurant space. There is a private room on the left of the large entrance and a salon is on the right. 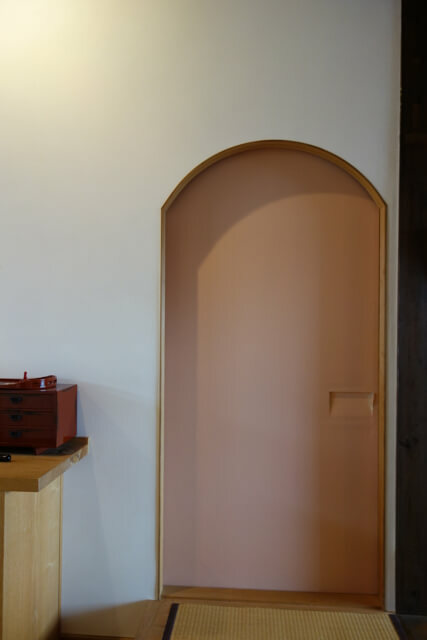 So cute sliding door with peach-colored Japanese paper. 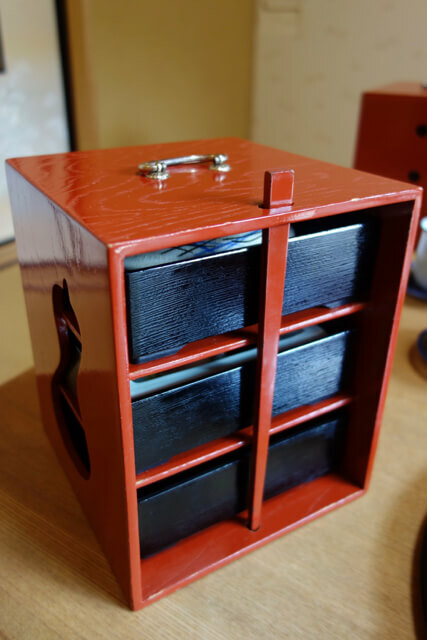 It is also wonderful that the upper part draws a curve. To just open it makes us excited. The private room is available for about 6 to 8 people. The Chinese letter art of “Ichigo Ichie” is impressive. It means it’s important to cherish the meeting at one time. The decoration is seasonally changed by the sensibility of the madam. A staff are preparing for catering at the counter, but it is assumed to be used by one person or as a cafe. It is good to have a cup of tea while talking to the madam. 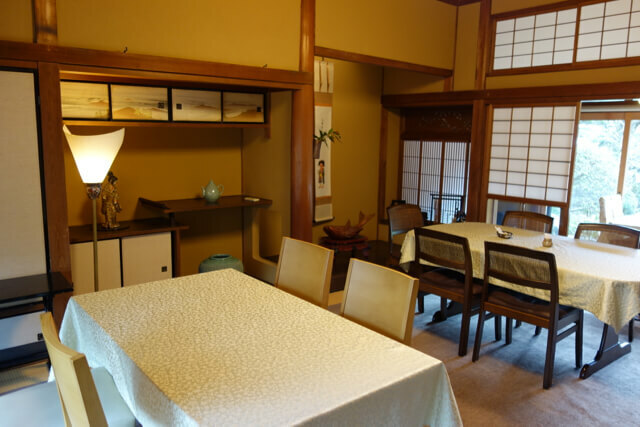 The salon has table seats in a Japanese style room. The tablecloth is also elegant. 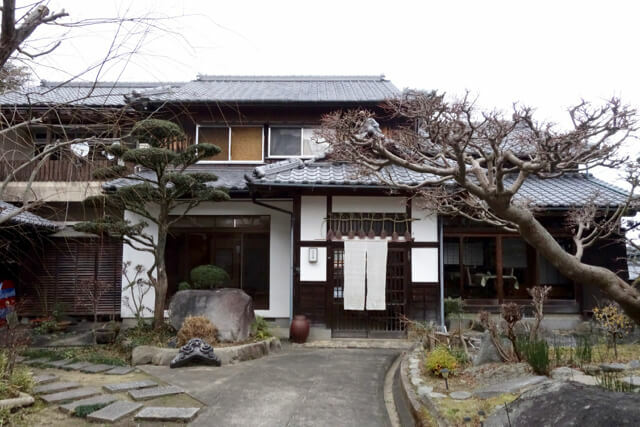 The Madam(Ms. Kobayashi) ‘s parents run a famous Japanese restaurant called “Koyo-an” in Kokura, Kitakyushu. She took over the taste of “Koyo-an” and opend the “Ukidake Saryo” in 2006. 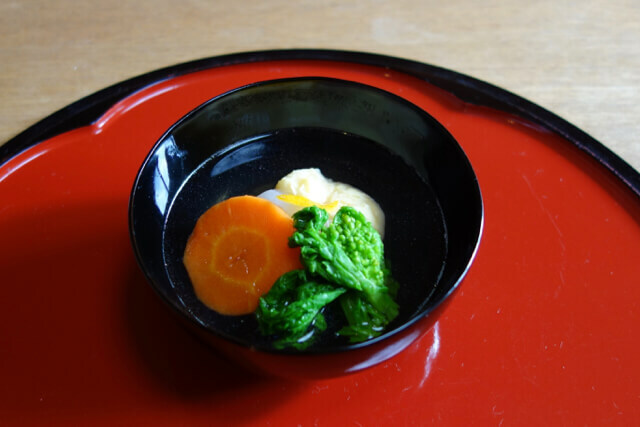 Do you know what is the Kaiseki? 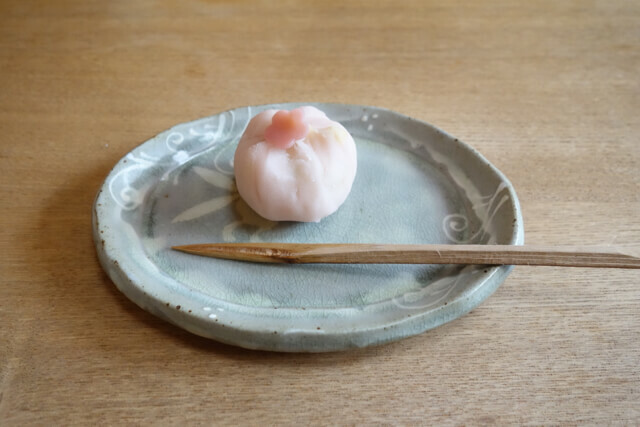 There was explanation of “Kaiseki” on the following site. 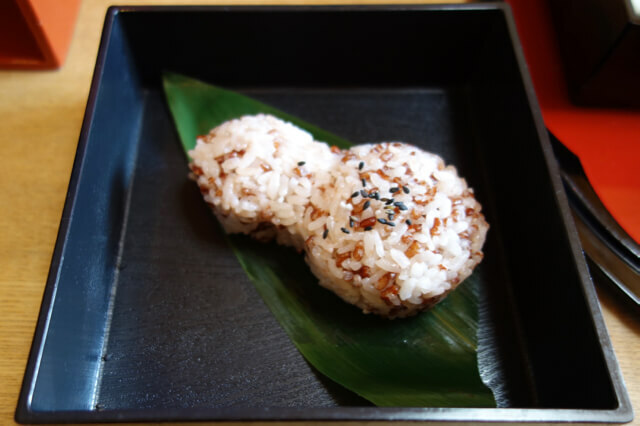 Reference: What is the difference between kaiseki and kaiseki cuisine?Actually the big difference is hidden! 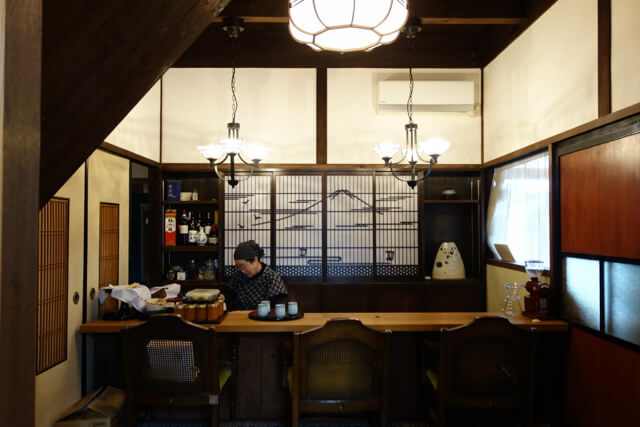 Actually, Kaiseki cuisine is a hospitality dish for enjoying tea! And it is a promise that you have rice at first. After that, dishes based on Ichiju-Sansai(=1 soup and 3 dishes) will come out, but there is personality depending on the restaurant. Kaiseki cuisine is not only delicious, but it is also characterized by the spirit of hospitality. It is outstanding delicious enough to make us feel relief from the first item already. 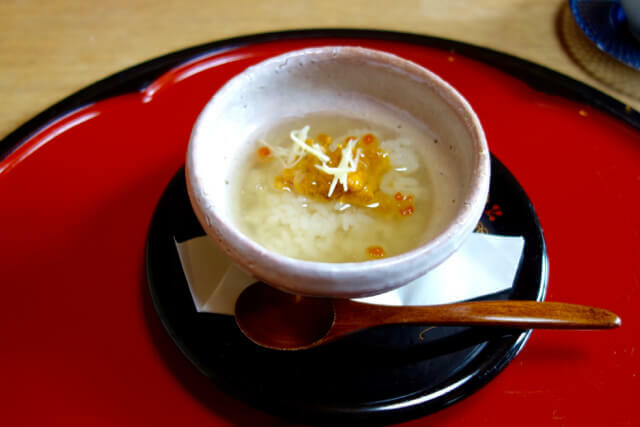 This day was still cold in January, so hot rice with “Kuzu-an (=arrowroot hot jam)” was served. Then, next one was on the battledore. It will be gleeful atmosphere at once. Especially red sea cucumber boiled with Hoji tea has a refreshing taste, removed the smell. Then, Yuzu(=Japanese citron) was spilled three times to remove the bitterness, and a grater is put on it. It was very fun with the taste like eating citrus jam. 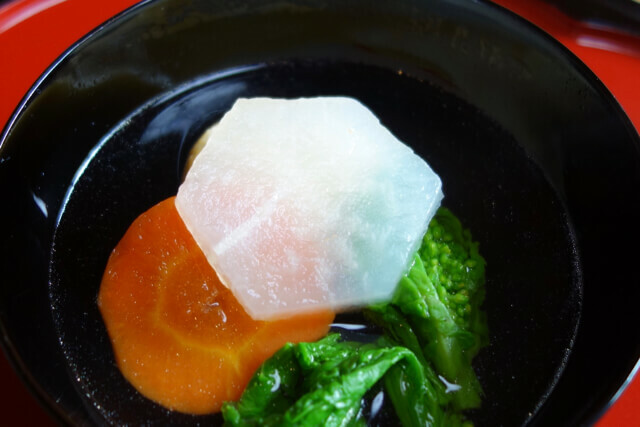 Since Dashi(=Japanese suop stock) is basic in all Japanese cuisine. So it is said that you can understand the value of the restaurant when you have a soup like this. It is a refreshing taste like clarifying the body. There was a radish that was hidden by canola blossoms and carrots and cut into hexagons. It seems to be a tortoise shaped. It is a little lucky stuff. 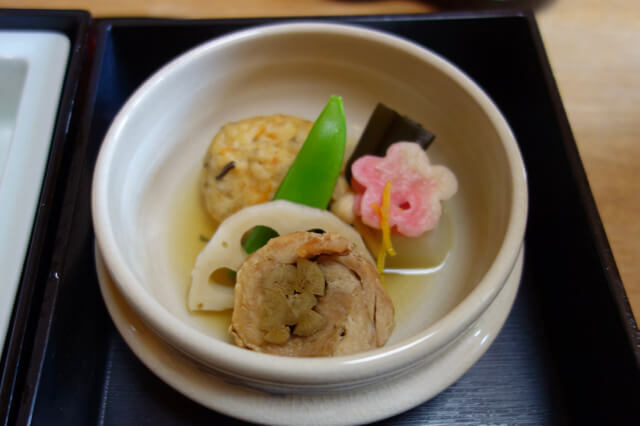 There are various styles in Kaiseki. 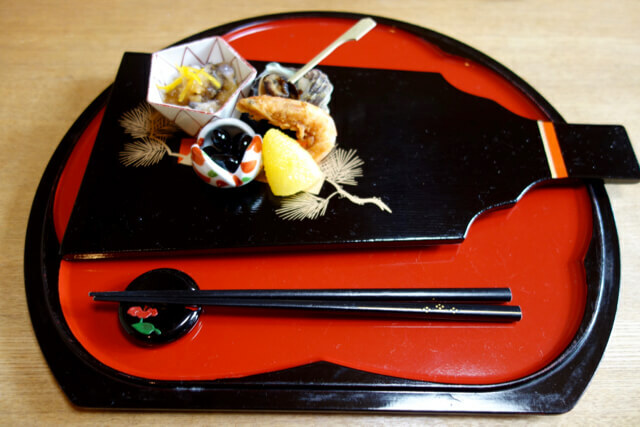 This is the “Hako Kaiseki” which means the one offered with a box. 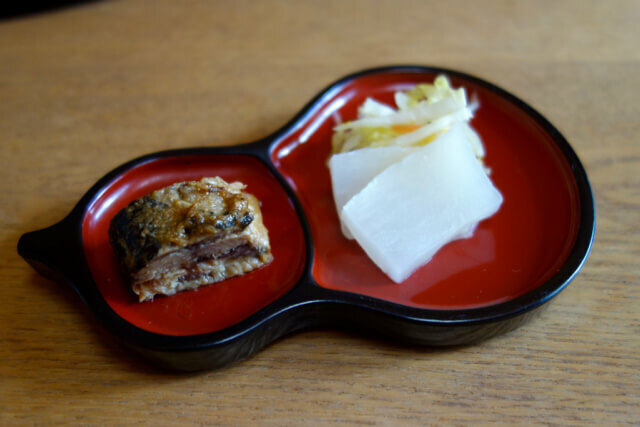 In Ukidake Saryo, the dishes was brought in 3 layers box which was called “Warigo”. 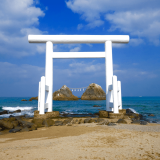 It’s rare, and you can often see it in Izumo, Shimane prefecture. Inside, there were Japanese stew, sashimi and rice. Ganmodoki is Deep-fried tofu and The dashi worked well. To make Ganmodoki, she used “Yamato potato”. 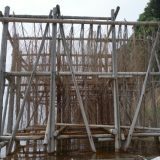 It is a fresh fish caught locally. 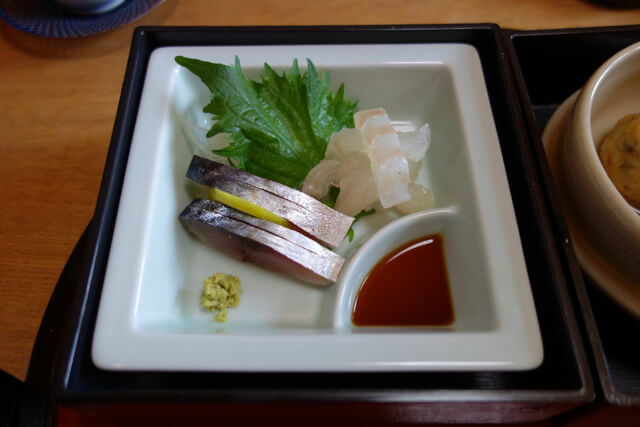 In Fukuoka, It is advantage that we can eat very fresh and delicious sashimi, because it faces the Genkai-Nada(=Genkai ocean) which is known as a very good fishing ground. And it is red rice, shaped like a gourd. 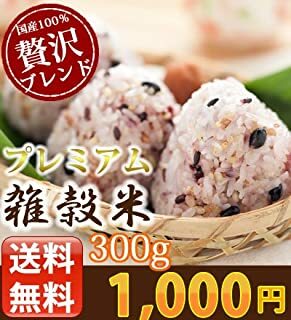 Red rice is a millet which was eaten in general before. It has high nutritional value and umami. 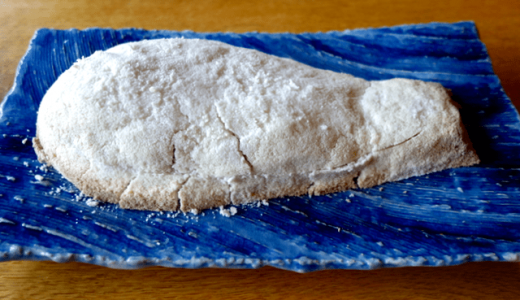 It is also a special product of Itoshima. The next one is Kitakyushu specialty! 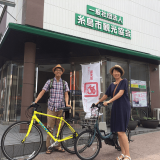 Speaking of Kitakyushu, Nukadaki is famous. 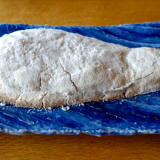 It means sardines boiled with rice bran. Here we can enjoy original Nukadaki the madam took over from her parents. 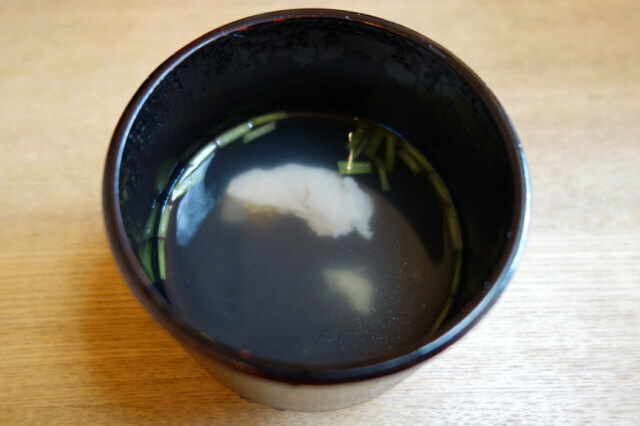 Ushio-jiru is made of the “dashi” of seafood. Well, it can be said as the main of “Kaiseki” dishes. It is an elegant taste. 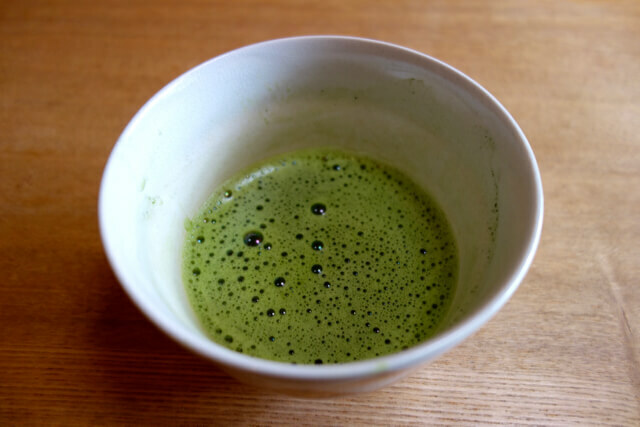 At last, it is the powdered green tea. Photography together with Madam(=Ms. Kobayashi) (third from the left). 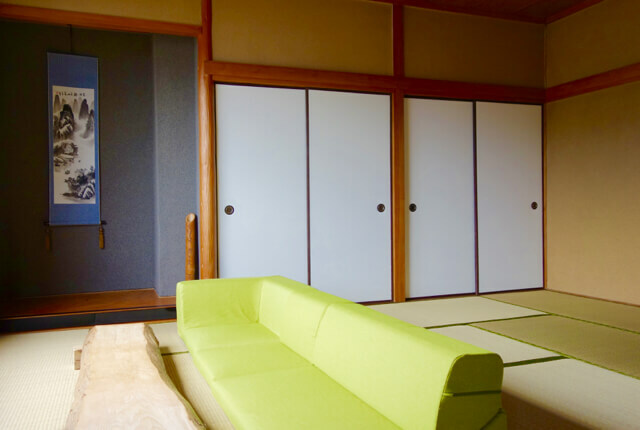 When you want to eat Kaiseki cuisine in Itoshima, please come to the Ukidake Saryo!